Troubleshooting and repairing your furnace is much easier if you know what type of furnace you have. The two main types of gas furnaces in the home are the conventional furnace and the newer high-efficiency condensing furnace. The technologies used in these furnaces directly impact the difference in their energy-efficiency, as represented by their AFUE (Annual Fuel Utilization Efficiency) ratings. Only condensing furnaces are able to achieve the highest AFUE ratings of over 90 percent, with some reaching over 98 percent. While the condensing furnace is different in its design and repair needs, it does have some similarities to a conventional furnace. Like a conventional furnace, it takes in cold air from the house and runs it through an air filter; it moves the air with a circulating fan; and it has a gas burner with electronic ignition (although condensing furnaces may have more electronic controls). The main difference between a conventional and condensing furnace is how the furnace handles the exhaust gases from the combustion process. 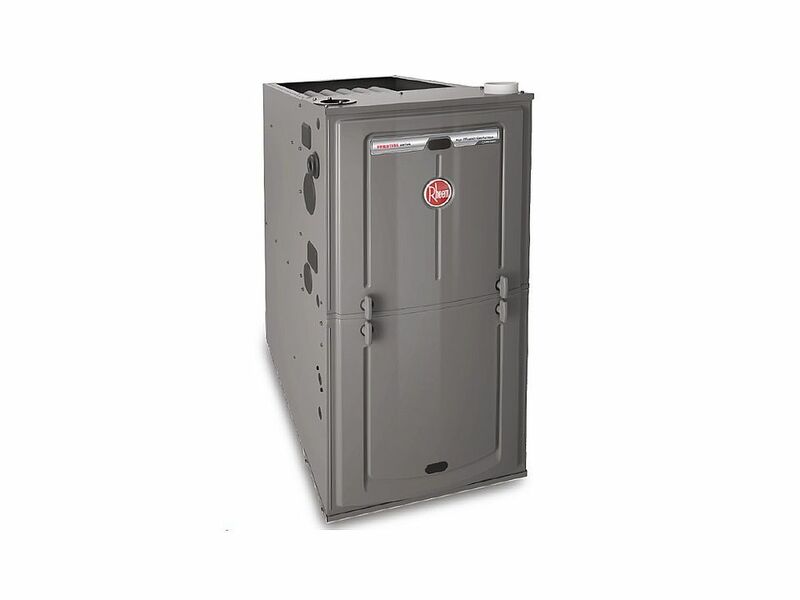 Both types of furnace have a primary heat exchanger, consisting of a combustion chamber where heat from gas burners is exchanged to the circulating air before it is distributed throughout the house. With a conventional furnace, the hot exhaust gases from the combustion chamber go directly into a metal flue and are vented to the outdoors. Because the exhaust gases are still very hot, all of that heat is wasted. With a condensing furnace, on the other hand, the combustion exhaust gases are also passed through a secondary heat exchanger that absorbs much of the remaining heat from the gases. As the gases cool, they condense to form water and carbon dioxide (which together form carbonic acid). The water (called condensate) drips out through a drain pipe, and the remaining flue gases are vented to the outdoors through a plastic pipe. The fact that you can use plastic for the vent pipe demonstrates how cool the gases are by the time they are exhausted. 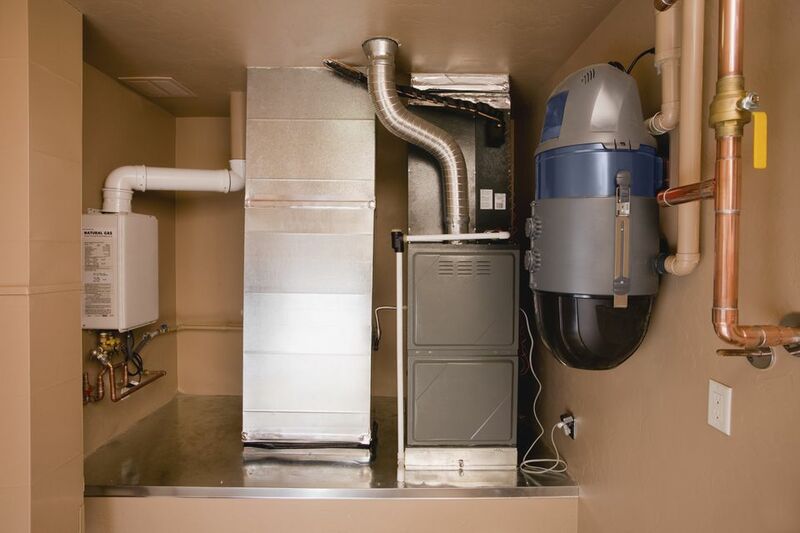 A condensing furnace generally operates the same way as a conventional furnace in circulating the air in your home. But high-efficiency furnaces often incorporate additional technology. Just as with a standard furnace, a condensing furnace filters and reheats return air from your home in a continuous looping action. Most of this air is simply recirculated over and over, but in addition, a small amount of fresh air usually is pulled in through cracks around windows and doors and other areas. When a home is well air-sealed, or "tight," it may warrant an optional fresh-air intake that pulls air from outdoors into the furnace and prevents partial vacuum situations. A heat-recovery ventilator, or HRV, is an optional device separate from the furnace that works as an air-to-air heat exchanger. It uses the stale, heated indoor air to pre-heat incoming fresh outdoor air before it gets to the furnace. Most condensing furnaces (and some conventional furnaces) use high-efficiency air filtration media to improve indoor air quality. These filters need to be changed regularly in order to work effectively. Different classes of filters are available, depending on your needs. If someone in your family suffers from allergies, for example, you can use filters designed to effectively capture known allergens. Condensing furnaces may have one of two types of blower motors: a standard permanent split capacitor (PSC) motor (the same type commonly found on conventional furnaces), or a variable-speed, direct-current electronically commutating motor (ECM). The latter is used with two-stage, or modulating, furnaces and is more energy-efficient than a standard motor. Blower compartments on high-efficiency furnaces are usually insulated to retain heat. Conventional furnaces usually are not insulated. Condensing furnaces are similar to conventional furnaces when it comes to fuel combustion—the standard components include a gas burner, electronic ignition, and a combustion chamber. However, there are some differences in how air is delivered for combustion as well as in burner gas valve technology. Conventional furnaces often use a single-stage burner gas valve, which means the burner has one "on" stage. With condensing furnaces, it is common to find at least a two-stage (dual-stage) burner gas valve, which has electronic controls that allow the burner flame to be at either high or low settings, depending on the level of heat required. The most efficient system includes a modulating (variable-capacity) gas valve and electronic control system for the burner, paired with an ECM-type blower motor. This allows for fine adjustments to the burner setting and blower motor speed, which makes for improved temperature control and energy-efficiency. Condensing furnaces always use electronic ignition systems for maximum efficiency and reliability. Older standard furnaces may use a standing pilot system, although newer ones may have electronic systems. Unlike conventional furnaces, a condensing furnace often uses a sealed combustion chamber and direct-vent combustion air. The combustion air intake usually is piped from the exterior of the home to the furnace. This means the furnace does not take air already heated by the furnace and use it for combustion. However, condensing furnaces can also be installed as single-pipe, non-direct-vent configurations, in which the combustion air is drawn from the indoors. This is most common when the furnace is located in an unheated space, such as a utility room or basement. The extraction of useful heat from the fuel combustion process is where a condensing furnace truly separates itself from a conventional furnace. The primary heat exchanger on a condensing furnace is similar to that of a conventional furnace. It is a system of specially coated steel tubing. In condensing furnaces, there is a secondary heat exchanger made up of small tubes that receive the exhaust gases once they have gone through the primary heat exchanger. Here, more heat is extracted, resulting in the gases that are cooled to the point that they condense into water and carbon dioxide. Because water and carbon dioxide from a slightly acidic condensate called carbonic acid, the secondary heat exchanger must be made of stainless steel to resist corrosion. The carbonic acid condensate from the secondary heat exchanger is drained via a PVC pipe and usually discharged into a floor drain. The flue gas exhaust temperature from a condensing furnace is fundamentally different than that of a conventional furnace. The condensing furnace flue exhaust is relatively cool and can be vented with a plastic vent pipe without use of a metal chimney vent. Condensing furnaces, like many conventional furnaces, use a draft-inducing fan and pressure switch. The flue gases from a condensing furnace can exit through a PVC, ABS, or CPVC pipe because of their low temperature (around 100 degrees F or less). They usually vent out through a wall of the home, at least 12 inches above grade or above the anticipated snow level.